For links to more language activities and resources, click on / Spanish / in the menu at the top of this page. Explore a map of the EU and find facts about Spain and other countries. Choose a category then point your mouse at an object to hear the word in Spanish. Select an activity then view it in English or Spanish by clicking on the language button. A classic bilingual Spanish/English word book, illustrated with busy scenes and labelled pictures to help children learn key Spanish vocabulary. Includes an English/Spanish word list and a pronunciation guide to ensure effective, long-term learning. Readers can hear how to pronounce every word by listening to a native Spanish speaker at the Usborne Quicklinks website. 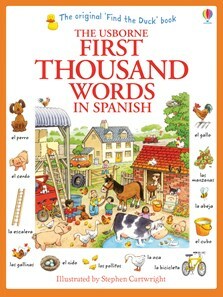 Usborne's 'First Thousand Words in Spanish'... Excellente!